Our trials are on this Friday, 1 March, starting at 3.30pm and finishing at 5.00pm. All boys, where possible, are asked to be in Football training gear for the afternoon. Those boys who do not have a training shirt or shorts are to wear Golds. The 2019 GPS Swimming Championship will be held on Friday, 8 March at Brisbane Aquatic Centre. 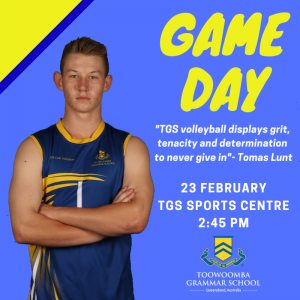 All Year 12 students are expected to attend and we also encourage students in other year groups to help support the TGS Swim Squad at this event. Information regarding the event can be found here. To register as a spectator please complete the online sign up below. Sign up closes Tuesday, 5 March. Attached are two forms for our first bivouac for the year, for your action. The bivouac is on the weekend of 23-24 March. If you are playing sport that weekend then please let me know when you return your forms including which team and sport you are playing. A sports bus will be organised for that weekend after sport to take cadets out to the bivouac. Please fill in both forms as we will be conducting a school based activity after we complete our AAC training for the weekend on the Sunday afternoon. Forms need to be returned by the 8 March to the Orderly Room. A packing list will be sent in due course. Recruits are required to purchase a number of items which are a one off requirement. These can be purchased from Tentworld Toowoomba on Anzac Avenue. A list is attached for your information. All other equipment is supplied by the Unit and issues will be made in a couple of weeks’ time at home training. Attached is the Activity Notification Form for the upcoming Glennie School Fair to be held on Sunday 10 March at The Glennie School. Please return your forms by the due date. Dress for the Fair is DPCU Barracks and cadets are to take a water bottle and money for morning tea and lunch. Cadets are to meet at the front steps of The Glennie School where you will be briefed by LT(AAC) Langston and Mrs Shaz Wilmington for the day. This year we will not have a stand but will have a couple of banners advertising cadets together with brochures that will be handed out. Cadets will be placed in a roster by CDTSGT Radford to sell raffle tickets throughout the Fair. The roster will be out shortly, and cadets are asked not to volunteer their time elsewhere until they have their allocated times for cadets or alternatively advise CDTSGT Radford when you will be helping out elsewhere at the Fair.